Norma Geraldine “Jeri” Warren, 91, entered heavens gates on Monday, March 18, 2019 at 11:12 p.m. at her home in Guyton under the care of her family and Kindred Hospice. Jeri was born in Malvern, Arkansas she was a daughter of the late Harvey and Esther Borland Thomas. 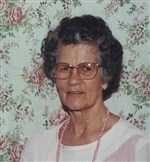 Jeri was a homemaker and a member of the Bethesda Methodist Church in Guyton. She loved cooking, being with her family, and fishing. She was a devoted wife, the best mother, treasured friend, loving sister, aunt, grandma, nana, and great-grandma. Jeri was preceded in death by a daughter, Gloria Ann Borling and a son, Gary Woodrow Wasdin. Surviving are her children Martha Karen Brown and her husband, James, of Statesboro, George Earl Wasdin and his wife, Laurie, of Pooler, Esther Darlene Floyd of Statesboro, and Nolan Lloyd Wasdin and his wife, Megan, of Guyton; her brother, Franklin Thomas of Garden Grove, California; her sister, Juanita Seckinger of John’s Island, South Carolina; sixteen grandchildren; several great-grandchildren; great-great-grandchildren and nieces and nephews. The family will receive friends from 1 until 2 o’clock Thursday afternoon, March 21, 2019, at Dean Forest Baptist Church – 1524 Dean Forest Road. The funeral service will be held at 2 o’clock Thursday afternoon, March 21, 2019, at Dean Forest Baptist Church conducted by the Reverend Guy Boyd. Burial will follow in Effingham Memorial Gardens. Remembrances may be made to Kindred Hospice – 2280 East Victory Drive, Suite A, Savannah, Georgia 31404. I am sad to read of Mrs. Warren’s death. I remember her well at Bethesda, a very faithful member as long as she was able to attend. May God be with her family, holding you in His hands of love.